FedEx is one of several big-name stocks set to announce earnings results over the next few trading days. Stocks posted modest gains last week to stay near record levels. 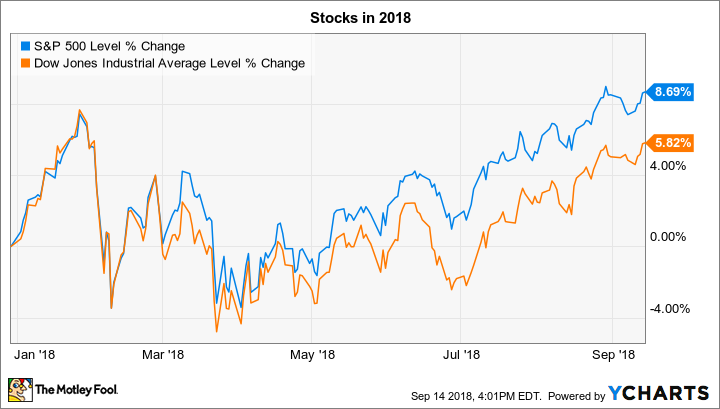 The S&P 500 (SNPINDEX:^GSPC) and the Dow Jones Industrial Average (DJINDICES:^DJI) each inched higher by roughly 1% and remain in solidly positive territory so far on the year. The coming week brings a few highly anticipated earnings announcements, including reports from FedEx (NYSE:FDX), AutoZone (NYSE:AZO), and Thor Industries (NYSE:THO). Below, we'll take a look at what investors can expect to see in these reports. FedEx's business is on an upswing heading into its fiscal first-quarter results on Monday. The package delivery specialist rebounded from a tough third quarter to close fiscal 2018 on a high note, with volumes rising and profitability improving in each of its three major business lines. The integration of TNT Express, plus a return to margin expansion in its ground division, supported an overall 9% sales boost for the prior 12 months as adjusted earnings jumped to $15.31 per share. Looking ahead, CEO Fred Smith and his team have predicted the same revenue growth rate for fiscal 2019 while profitability continues to expand alongside an improving global economy. Capital spending should tick lower, but FedEx still expects to invest more than $5.5 billion in maintaining and upgrading its vast shipping infrastructure this year. Any changes in the pace of world trade might require a shift to that outlook on Monday, but the broader growth picture suggests the company should have positive comments about its expectations for sales and profit gains over the next few quarters. Investors are expecting to hear good news from auto parts giant AutoZone when it posts results on Tuesday. Back in May, executives said that the company's unusually weak third-quarter numbers were due to a cold spring weather pattern that caused a delay in maintenance spending for many of its customers. Much of those sales should simply shift into the next quarter, they predicted, so comparable-store sales growth this week will likely mark an improvement over the previous 0.6% uptick. Peer Advance Auto Parts observed recently that its sales growth sped up significantly over the past few months. The retailer also lifted its revenue outlook while citing an improving demand environment in the parts industry. Given the rebound in Advance's stock over the last few months, investors are expecting to hear similar news from AutoZone, and are looking both for sales acceleration and an optimistic outlook for the new fiscal year ahead. Concerns about rising costs and slowing growth have pressured stock price gains for Thor Industries investors lately. The recreational vehicle specialist has benefited from an eight-year expansion in the industry, and those generally strong trends held up over the last few months. Sales rose 12% in the fiscal third quarter thanks to solid demand in both the motorized and towable segments of its business. Profitability, on the other hand, dipped as costs on inputs like steel and aluminum rose. Investors are bracing for more cost growth and another slowdown in sales gains when Thor announces its fiscal fourth-quarter results on Thursday. But it's the RV giant's outlook that will likely power any big swings in the share price this week. As of early June, management said healthy fundamentals in the industry should support another year of record sales. Over the longer term, it's good news for Thor and its peers that customers are taking up the RV lifestyle at a much younger age than in the past, so cyclical growth periods promise to be more robust going forward.